With a mighty roar this young bull sea lion bellows out that this rock in Resurrection Bay near Seward, Alaska is his rock. Nestled between snow-capped mountains and hosting an abundance of otters, porpoises, seals and sea lions, sea birds by the tens of thousands and with whales almost a given, the bay offers lots to look at. A morning filled with sunshine, calm seas and friends visiting from out of town were inspiration to take our C-Dory out for a lap around Resurrection Bay. Sea otters like this curious spy-hopper are abundant along the shoreline. 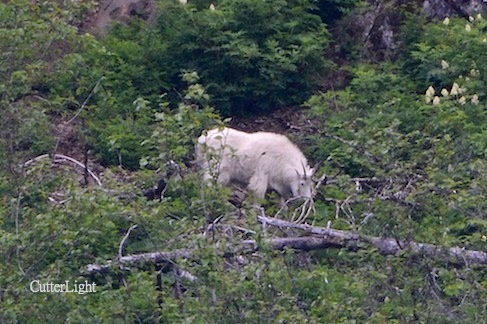 Meanwhile, scan the mountainsides on the east side of the bay for puffy white balls; put binoculars on them and they might become mountain goats. A pair of juvenile sea lions were swimming in the harbor near our boat as we made ready, and almost as soon as we cleared the marina a harbor porpoise arced near our boat. Bald eagles chirped and spiraled in the blue sky overhead, terns and kittiwakes dive-bombed for small fish, and several cormorants, including a crested cormorant, were drying their wings on the remnants of a pier after a morning of fishing. 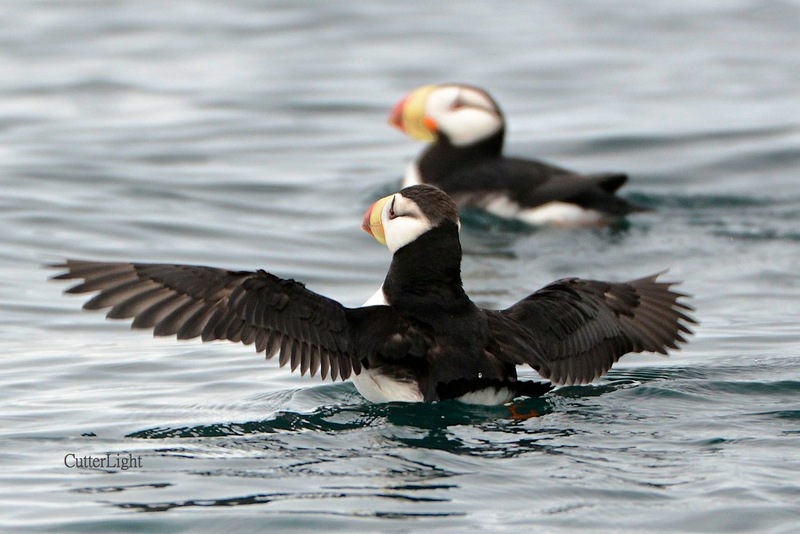 Horned puffins are among the tens of thousands of seabirds that nest in the rocky mountainsides surrounding Resurrection Bay. No cruise is complete without encountering the whales that call the outer parts of the bay and the nearby Alaska Gulf home. 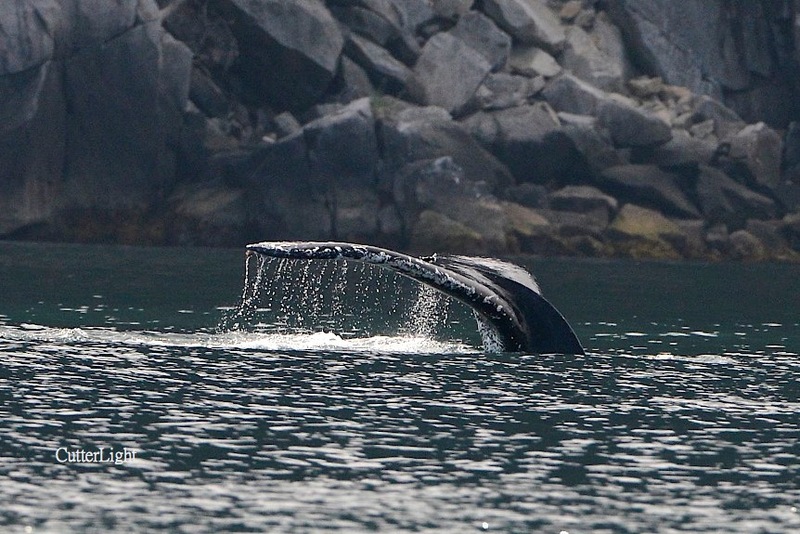 This sounding humpback appeared to be feeding on herring. There’s sometimes a fine line between love and aggression. 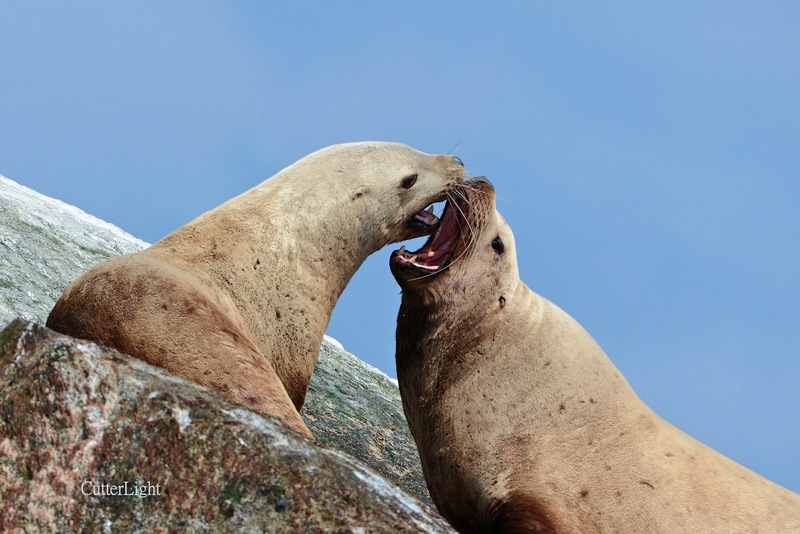 At one point, the smaller sea lion appeared to have its mouth entirely inside the larger one’s. After some barking back and forth and a little more bared-teeth interplay, the larger animal slid into the ice water – perhaps to forage. Approaching Cape Resurrection by boat, you can smell the rookery well before your eyes pick out individual birds on the whitewashed cliffs. Here, thousands upon thousands of black legged kittiwakes jockey for position as they haphazardly construct precariously perched nests. 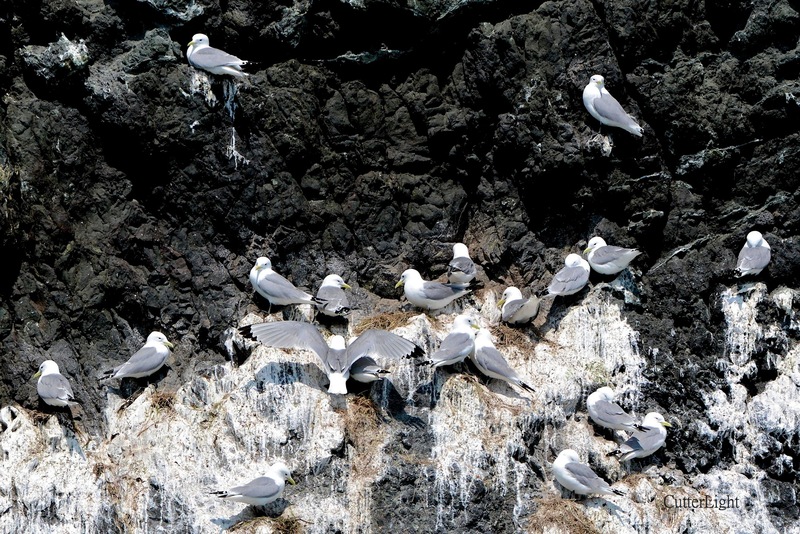 Dense rafts of murres rest near current seams that disorient small fish – the murres’ prey. At times, acres of herring can be seen just below the surface of Resurrection Bay’s waters. 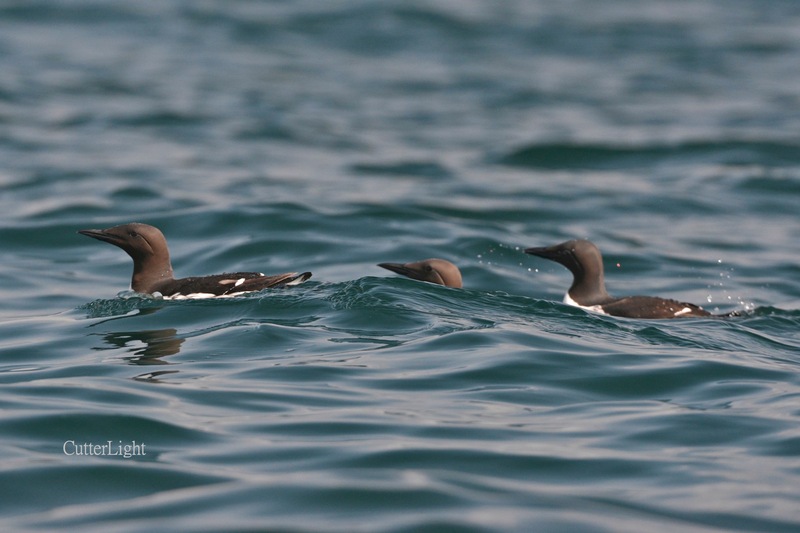 Thick-Billed Murres are so common it can be easy to forget what amazing birds they are. Somewhat stubby-looking on land, they can achieve flight speeds of 75 miles an hour. In water, they transform into sleek acrobats, capable of dives to over 300 feet deep – the length of a football field. 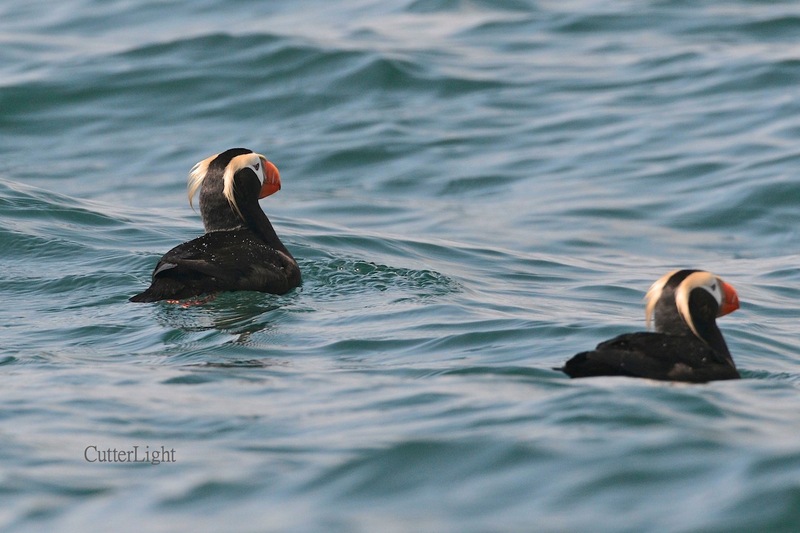 A pair of tufted puffins, golden sunlight illuminating their eponymous feathers, glide through the waters of Resurrection Bay in search of small fish. Whether life takes you to coastal Alaska or some other shore, we can’t recommend a boat tour of inshore and nearshore waters highly enough. In Seward, local tour boat companies offer daily cruises captained by experienced National Park Service rangers – a not-to-be-missed experience. Thanks for the reblog. 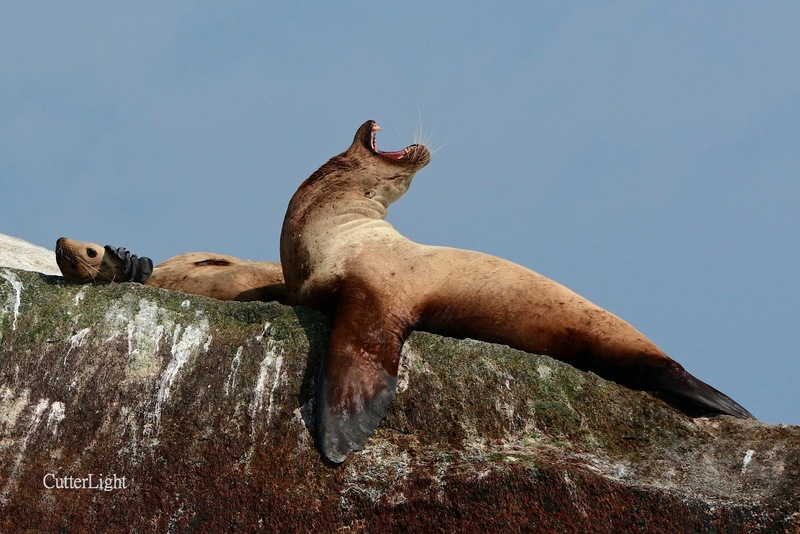 In some locales on America’s west coast sea lions are notorious for stealing salmon right off fishermen’s lines. But we agree, they are cool animals. I thought you meant Orcas Island and I was like WHAT! Thanks. We have some good shots of orcas we will be posting in the not-too-distant future.